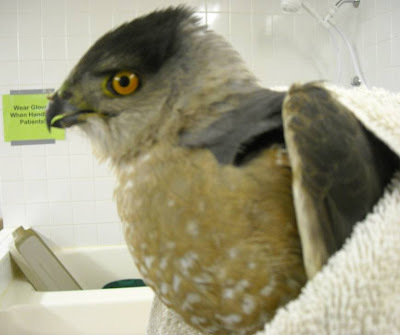 REGI is always a busy place, but the past 24 hours have brought three new eagle patients plus an adult male Cooper’s hawk, an American Goldfinch and several Pine Siskin. I am going to begin using the patient numbers to better identify them for everyone. The first adult Bald Eagle (# 142-09) had been seen on the shore of Lake Superior for several days. He was weak and was dragging a wing. His left wing is fractured. We are concerned he may have hit a power line. The feathers on the left wing appear to be singed. Electric burns take a few days to demonstrate themselves. He is a beautiful adult male bird in the prime of his life. 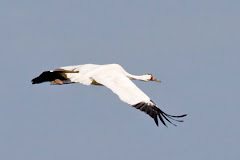 Our focus is always to get the bird back into their natural environment however that is not always possible. If the bird is not able to make a 100% recovery we give it the best possible option for a full life even if that is in captivity. It could be placement in an educational facility or working as a foster parent for young orphaned eagles that come into rehabilitation. When young birds are reared by foster parents they do not imprint on humans. 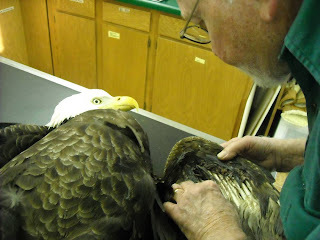 (photos: Don Gibson examines wing of bald eagle patient from Lake Superior #142-09 and in pnoto below the wing is washed and treated. About 9 P.M. Tribal Conservation Warden Don Waukechon received a call about an adult Bald Eagle found in a wooded area near Neopit. 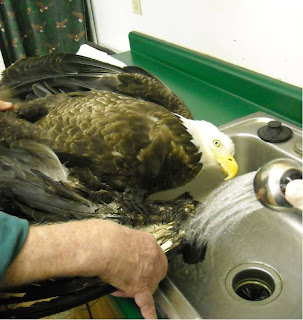 The eagle (#143-09) was unable to fly. 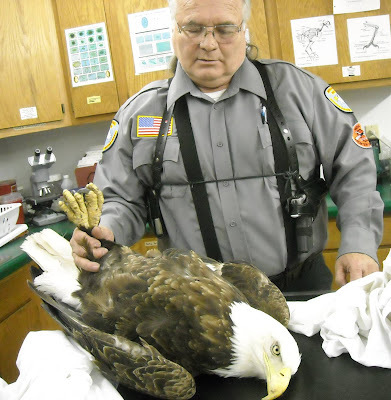 Don is a long time warden and has rescued many bald eagles in the past. This time was no different. Don was able to capture the bird and bring him to REGI for care. This bird is also an adult male bald eagle. He is an older bird. He is very thin at 5.6 lbs. He was having seizures when he arrived. We did blood work on admission. He is anemic. His blood lead is within normal range, so this time it is not lead poisoning. 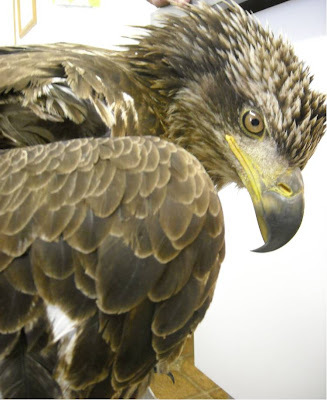 Lead poisoning is so common in bald eagles I begin to assume it is the problem until the testing comes back. We suspect he has encountered a toxin of some kind and will continue to test him until we find the problem. The eagle was able to keep down a small amount of food and is digesting which are both good signs. His convulsions while still present are slowing in both interval and intensity. Gus Frank found an immature Bald Eagle (#144-09) near Crandon, WI late afternoon today. (4-15) Gus gave him the Indian name Na Kwe ga Boe which translate to “The lights always shine on you”. The beautiful three year old male was found on a roadside and was likely hit by a car. There are no obvious fractures but he is very weak. X-rays will have to wait until he is in more stable condition. With the risk of internal bleeding high with this type of impact injury keeping the bird as quiet as possible and in a low stress environment is the most important thing. He did receive vitamin K to help stop internal bleeding. He is becoming aware of his surroundings. The Coopers Hawk (#140-09) is a beautiful adult male bird. He was likely hit by a car. He has a serious head injury but even the twelve hours since his admit ion the head injury has improved. He also has a broken wing. Wing injuries while serious, are something we can fix. We have a very good success rate with wing fractures. Head injuries are less straight forward. The same complications occur that plague human patients after a head injury. This patient is spirited and full of life however and that is always a positive thing. So far everyone is doing well. 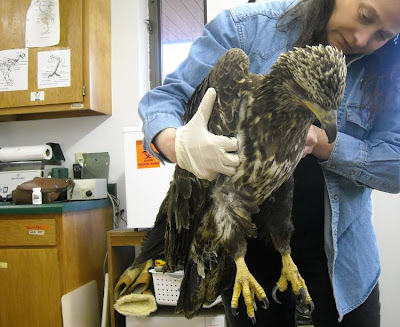 The bald eagle that was impaled on a stick about 10 days ago has begun flying short distances. She has received two rounds of treatment for her lead poisoning. She has another blood test tomorrow to see if she will need another course of treatment.